Electronic drum kits are not silent, so what can you do to tame their thumps and rumbles? As musicians working from home, there's one thing we've probably all experienced at some point — complaints from neighbours or family members about the noise we make. Guitarists, bass players and keyboard players have it easy, as they can just stick on a pair of headphones. 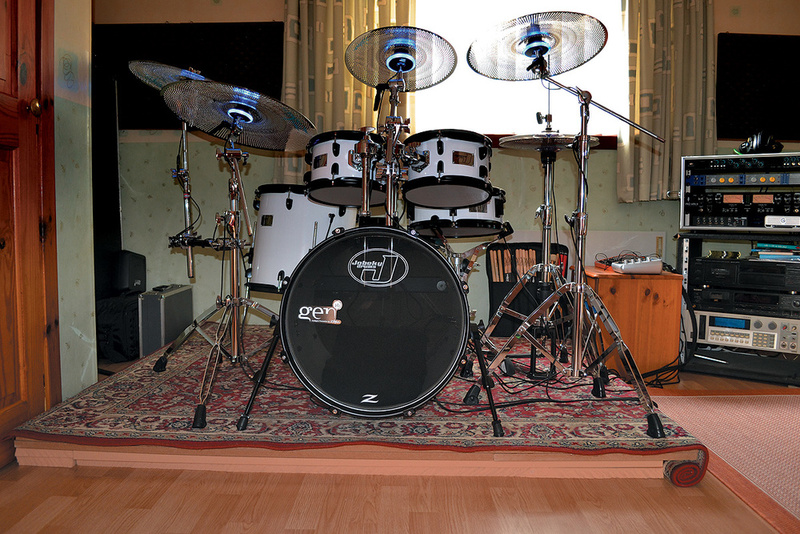 We drummers on the other hand don't, especially when it comes to having a full-blown acoustic kit set up in the house. So electronic drums seem to be the answer for drummers looking at practising or recording at home because they are totally silent, right? Wrong! Electronic drums have their own noise-related issues when it comes to playing at home. But don't worry, because for there's an easy and affordable bit of DIY that you can do to avoid upsetting the neighbours. Electronic drums can create noise in a variety of ways. I'm not talking about the volume of a speaker or headphones, of course, but of structural noise and vibrations. One of the most obvious comes from sticks hitting the drum pads, especially when those pads arethe solid type, and don't have mesh heads fitted. Most electronic kits are set up on a rack of some sort, and vibrations from the pads being struck work their way through the rack and down into the floor. The same goes for cymbals pads, the vibrations once again work their way through the cymbal boom arm through the drum rack and into the floor. Then you have the bass-drum pad where the thump from the beater hitting the pad and also the mechanical vibration from the pedal work their way into the floor. All these factors can be quite annoying to neighbours — in particular, downstairs neighbours if you're in a flat, but also to next-door neighbours for many more of us. All they hear is 'thump, click, thump, click' for hours at a time, and it can be a huge source of frustration and animosity. Thankfully, there's an easy solution to this problem, which is to build an anti-vibration riser for your electronic kit. A common solution to the problem of noise emanating from an electronic kit is the 'tennis ball riser', in which tennis balls are placed between two boards and held together with cable ties. However, the drummers who opt for this construction aren't actually sitting on the riser, so they have to raise their drum thrones in order to play. Not wanting to go down that route, I determined to devise my own remedy, which would be more stable and, importantly, deal more effectively with the vibrations from the kit. My own scenario was that my next-door neighbour could hear the thump coming from my electronic bass drum. It's not the noisiest of kicks, as it's fitted with a mesh head, and my kit was already set up in my home studio on a heavy rug, on top of a laminate floor. Despite all this, the mechanical thump from my bass drum was vibrating into the floor structure and transferring via this into my next-door neighbour's sitting room. In short, I had to find a solution if I wanted to keep playing! I remembered an SOS article in which Paul White had constructed a drum riser using good old Rockwool (ie. mineral wool) and two layers of marine plywood. I also looked at the 'platfoam' idea, which is that you simply float boards on top of strips of high-density foam. 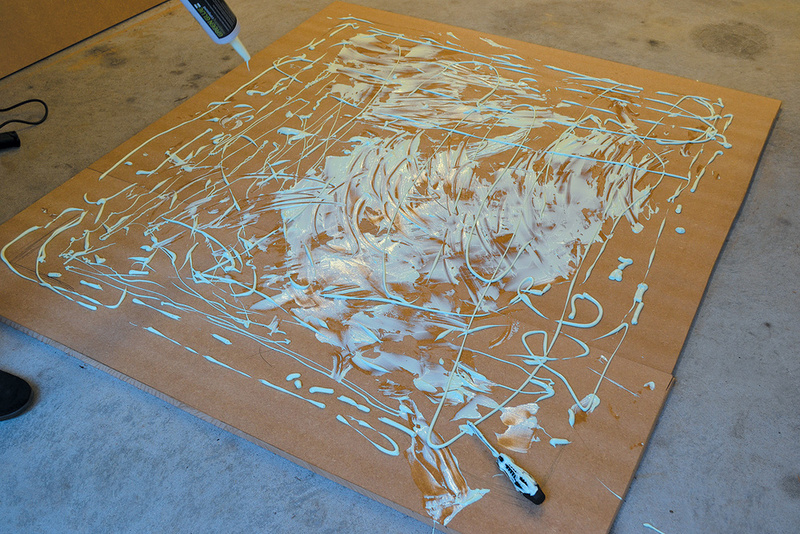 After researching and considering the various options and speaking to several different acoustic treatment companies, it was suggested that I try floating two layers of MDF board in a similar way, but with a layer of 'Green Glue' — a soundproofing compound — between the two sheets. More specifically, the suggestion was that this MDF sandwich would be floated on sheets of high-density Class-O acoustic foam. Initially, I felt a little unsure about the prospect of using foam, largely because of the possibility of it compressing under the weight of both the kit and myself, so I took further advice from Paul White about this — and became more confident that this type of construction should do a good job of absorbing floor-borne vibrations. Green Glue is excellent stuff when it comes to dealing with vibration, but do note that it starts curing rather swiftly — so (particularly if you spill it like we did!) you need to act quickly! Still a little unsure of precisely what foam to use, I contacted a company called CMS Acoustics and spoke to anti-vibration specialist Jim Herbert. He recommended a type of foam called Regufoam 150, which is both open and closed cell in it's construction, and is a high-density foam, but it has better load-bearing properties than Class-O acoustic foam. Regufoam 150 is a high-quality PUR foam which is specially formulated to attenuate noise and vibrations from all sources, and Jim very kindly supplied me with the foam for the purpose of constructing the drum riser featured in this article. I will say that Regufoam 150 is quite expensive, but if that's an issue you can get similarly good results using either high-density Class-O acoustic foam, or high-density Rockwool. The reason I decided in the end to go with the Regufoam was due to it's load-bearing properties,as my own electronic kit and hardware are similar in size and weight to a typical acoustic drum kit. For most people with a typical V-Drum kit, say, that will be less of a consideration. Three 18 x 2400 x 1200 mm MDF boards. Two tubes of Green Glue, plus applicator gun. High-density Class-O acoustic foam sheets (25mm), or RW5 high-density Rockwool (75mm). A drill and a jigsaw. A spare pair of hands — this is really a two-man job! 1. Start by cutting the MDF sheets to size. For me, this involved cutting two full sheets to the required length, then using the third sheet for two strips, to make up the width. Then place the MDF on the floor and mark out where the screws would go — I used 300mm intervals all across the riser, which worked well enough — before drilling small pilot holes. Here you can see the simple construction of the riser in more detail, with two layers of acoustic foam, topped with two MDF boards, joined by a layer of Green Glue. The rug is optional, but makes things look much nicer! 3. Next, cut the Regufoam 150 to the required size and place two 25mm layers on top of each other, to give a 50mm layer of foam. 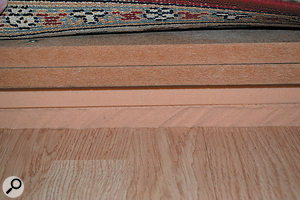 Put this on the floor in your studio, making sure that it's placed tightly up against the skirting board. 4. 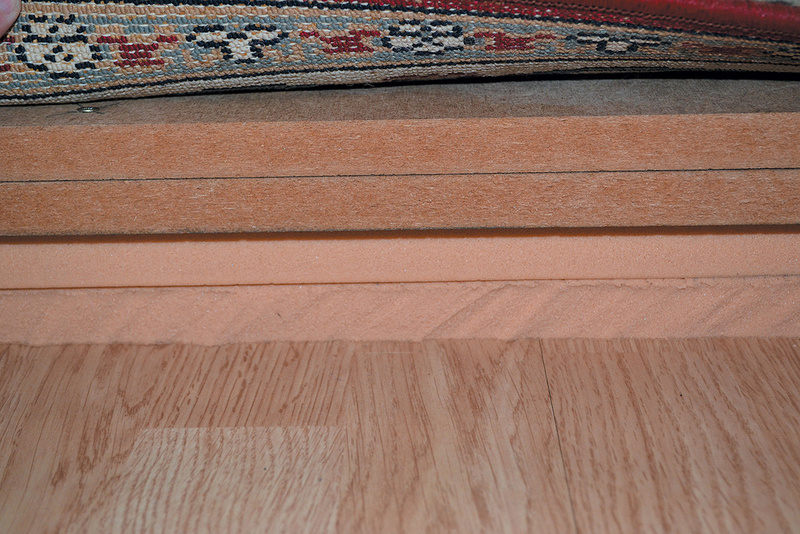 Lay the MDF platform on top of the Regufoam sheets, ensuring the platform does not come into contact with the skirting boards. Otherwise it will 'short out' and transfer any vibrations from the platform back into the walls. Once the MDF sheets are layered with the Green Glue the platform will be very heavy, and lifting it into place really does require a spare pair of hands. 5. Finally, if you wish, place a heavy rug on top of the MDF platform. Building this riser has made a massive difference to me. With everything good to go, I set about assembling my kit on the riser, and immediately noticed how solid and dense things felt in comparison with having the kit set up on the floor, as usual. I can no longer detect any vibrations from the bass drum going into the floor, and having carried out listening tests throughout the house, I can say withconfidence that the kick drum is now more or less silent. The Green Glue compound takes anything between 14 to 30 days to cure properly, and as things settled over this time, what little vibration was detectable was further reduced. I really would recommend that anyone with an electronic kit at home who's getting complaints from neighbours take the time to build one of these risers. I invested quite a bit in my electronic kit, and the cost of building this riser pales into insignificance next to it. 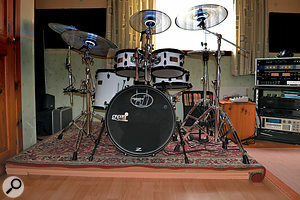 It's worth every penny, given that I can now play my kit whenever I want without any complaints! Thanks to Jim Herbert at CMS Vibration Solutions for supplying the Regufoam 150.